Bacillus (Latin "stick") is a genus of Gram-positive, rod-shaped bacteria, a member of the phylum Firmicutes, with 266 named species. The term is also used to describe the shape (rod) of certain bacteria; and the plural Bacilli is the name of the class of bacteria to which this genus belongs. 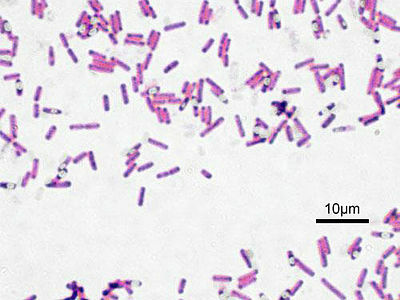 Bacillus species can be either obligate aerobes: oxygen dependent; or facultative anaerobes: having the ability to be anaerobic in the absence of oxygen. Cultured Bacillus species test positive for the enzyme catalase if oxygen has been used or is present.Bacillus can reduce themselves to oval endospores and can remain in this dormant state for years. Endospore formation is usually triggered by a lack of nutrients: the bacterium divides within its cell wall, and one side then engulfs the other. They are not true spores (i.e., not an offspring). Endospore formation originally defined the genus, but not all such species are closely related, and many species have been moved to other genera of the Firmicutes.Ubiquitous in nature, Bacillus includes both free-living (nonparasitic) species, and two parasitic pathogenic species. These two Bacillus species are medically significant: B. anthracis causes anthrax; and B. cereus causes food poisoning. Many species of Bacillus can produce copious amounts of enzymes which are used in various industries, such as the production of alpha amylase used in starch hydrolysis, and the protease subtilisin used in detergents. B. subtilis is a valuable model for bacterial research.